If you find it difficult to move the mouse or wish to have an alternative way to the mouse using the arrow keys on the numeric keypad follow the below steps. Microsoft Windows users can enable the accessibility feature to move the mouse using their arrow keys by following the below steps. 1. Click Start, Settings, Control Panel. 3. Click the Mouse tab. 4. Check the “Use Mouse Keys” check box. 5. If you wish to increase the speed or change any other settings, click on the Settings button. 6. Click Apply and then close out of the box. Each month we select the best of the tips submitted by members of the PC Pitstop community through our forums. Check out our past favorites, HERE. tips broken mouse, computer tips, keyboard shortcuts, mouse cursor. permalink. 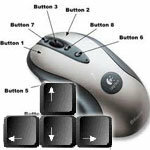 Most of us will want a mouse alternative only when the cursor cannot be moved generally for reasons unknown. You can’t even execute a normal shutdown. This “tip” is nigh useless under these circumstances because you need to turn on features thst are not normally enabled. Now if we could perhaps have a method where the two methods of moving the cursor were available that might be genuinely useful.